Free USMLE Multiple Choice Questions for Biochemistry. Multiple choice questions are concerned and focus on high-yield topics, and require multi step critical thinking. A 6-year-old boy presents to his pediatrician with skin lesions all over his body. For several years he has been very sensitive to sunlight. Neither the boy’s parents nor his siblings have the same skin lesions or sun sensitivity. Biopsies of several of the boy’s lesions reveal squamous cell carcinoma. Which mutation would one expect to see in this patient’s DNA? disease characterized by a defect in excision repair. the development of skin cancer and photosensitivity. 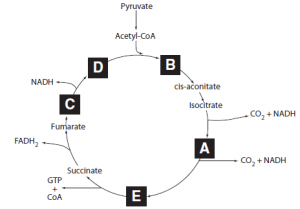 A metabolic process is pictured in the image below. Which intermediate in this process inhibits the rate-limiting enzyme of glycolysis and activates the rate-limiting enzyme of fatty acid synthesis? and allosterically activates acetyl CoA carboxylase. A 32-year-old develops polyuria. Her nephrologist monitors her closely on a water deprivation test, and she continues to have increased urine output. A diagnosis of diabetes insipidus is made. The nephrologist orders an antidiuretic hormone level and determines that it is inappropriately elevated. Which of the following is the site of pathology in this patient? is not related to the pathology of diabetes insipidus. A 35-year-old man presents to the physician with arthritic pain in both knees along with back pain. He states that the pain has been present for months. In an effort to obtain relief, he has taken only aspirin, but this has been of little benefi t. The patient is afebrile, and his slightly swollen knee joints are neither hot nor tender to palpation; however, the pain does restrict his motion. The cartilage of his ears appears slightly darker than normal. No tophi are present. A urine specimen is taken for analysis of uric acid content and turns black in the laboratory while standing. A defect in which of the following is the most likely underlying cause of the patient’s condition? 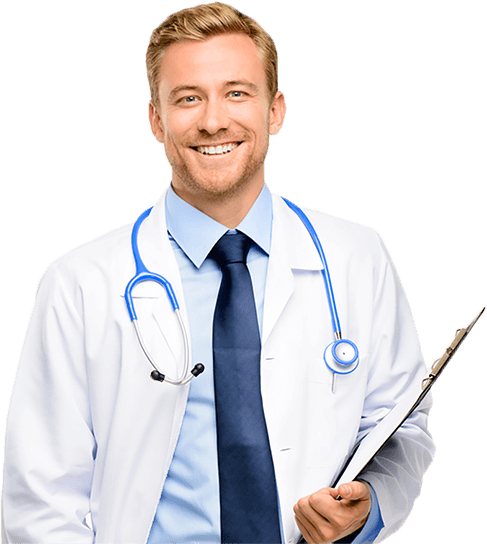 contact with air or when the urine is made alkaline. A patient who is a carrier of sickle cell trait presents to the clinic. The single base-pair mutation for sickle cell anemia destroys the MstII restriction enzyme recognition site represented by an asterisk in the image. The restriction enzyme- binding sites are shown as arrows on the map. DNA from this patient is treated with MstII and run on an electrophoresis gel. The DNA is then hybridized with a labeled probe that binds to the normal gene in the position shown on the map. In the Southern blot shown in the image, which lane represents the patient? eliminates an MstII restriction site. Phosphatidylcholine is a major component of red blood cell membranes, myelin, surfactant, and cholesterol. Phosphatidylcholine is synthesized through phosphorylation of choline obtained from the diet or with reused choline derived from phospholipid turnover. De novo synthesis requires an addition of three methyl groups, transferred from an amino acid. Without the turnover component, defi ciency in which essential amino acid would make dietary choline essential for phosphatidylcholine synthesis? very common methyl group donor. A DNA fragment is added to four different tubes along with DNA polymerase, a radiolabeled primer, and the adenine, thymine, cytosine, and guanine deoxynucleotides. Each tube also contains one of the four bases as dideoxynucleotides. The four tubes are then run on electrophoresis gel and visualized by autoradiography. Which of the following laboratory techniques does this describe? randomly terminate growing strands of DNA. A DNA segment is treated with restriction enzymes, pipetted into a well of polyacrylamide gel, and subjected to an electric fi eld. Next, the gel is stained with ethidium bromide and visualized under ultraviolet lights. What laboratory technique does this describe? uses an electric fi eld to separate molecules based on their sizes. The negatively charged DNA migrates in the electric fi eld toward the positive end. Smaller fragments move more rapidly through the gel. Bands of DNA can be visualized by staining the gel with dyes such as ethidium bromide. Increases in intracellular calcium can be especially detrimental to the cell. Therefore, calcium homeostasis is very tightly regulated not only across the cell membrane but also through the additional work of sequestration in endoplasmic reticulum and mitochondria. In which of the following ways does increased intracellular calcium concentration cause the most cell damage? and within discrete compartments within the cell (ie., mitochondria). Free intracellular calcium can activate several enzymes whose cumulative effect is to induce signifi cant cell injury. A few important enzyme classes include ATPases, which decrease ATP supply; phospholipases,which decrease membrane stability;endonucleases, which induce DNA damage;and several proteases. A scientist working in a research laboratory has been examining different agonists of serotonin receptor 1B (5-HT1B), a G-protein-coupled receptor. Compound A has a much higher affi nity for 5-HT1B than compound B. Both compounds have a higher affi nity for the receptor than serotonin. Which of the following describes the relationship between compound A and compound B when considering the guanine- nucleotide exchange activity of 5-HT1B?